The four outbursts observed in MAXI J1957+032. Credit: Beri et al., 2019. Generally, X-ray binaries are composed of a normal star or a white dwarf transferring mass onto a compact neutron star or a black hole. Based on the mass of the companion star, astronomers divide them into low-mass X-ray binaries (LMXB) and high-mass X-ray binaries (HMXB). 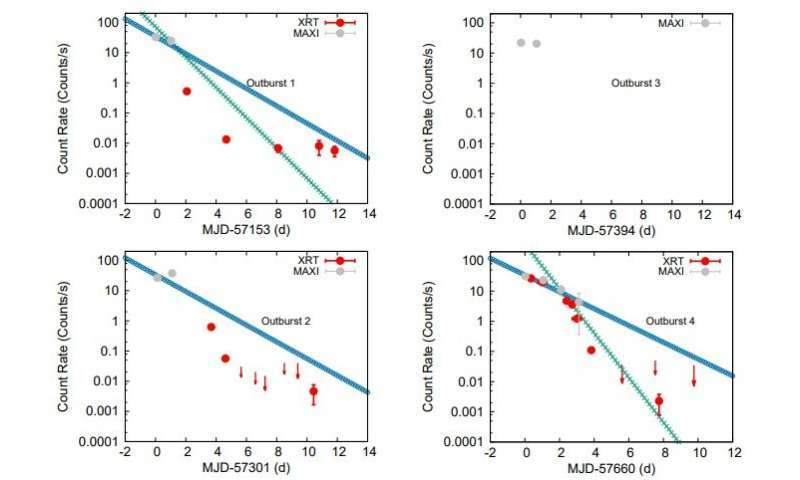 In the case of MAXI J1957+032 (other designation IGR J19566+032), the nature of its components is still debated, while some studies even propose that it is a triple star system. Previous observations have shown that MAXI J1957+032 is located in our Milky Way galaxy, with uncertain distance estimates (from 6,500 to 26,000 light years from the Earth), and classify it as a transient faint low-mass X-ray binary (LMXB), given that it sporadically experiences outbursts. MAXI J1957+032 was observed by the Swift telescope during its outbursts in 2015 and 2016. According to a team of astronomers led by Aru Beri of Indian Institute of Science Education and Research (IISER) in India, these observations, complemented by data from Monitor of All-sky X-ray Image (MAXI) instrument on the International Space Station, could answer the question whether the compact object in this system is a black hole or a neutron star. "In this paper we present the evolution of all the outbursts observed with MAXI and Swift, and we used the results obtained by Wijnands et al. (2015) to try to get more insights into the nature of MAXI J1957+032," the researchers wrote in the paper. Studying outbursts in MAXI J1957+032 Beri's team found that the spectra soften as the luminosity increases, noting also that the observed value of power-law index is at a level of about 2.5 near the end of the outbursts. In particular, they found that while the power-law index generally increases with time, the 0.5–10 keV absorbed flux decreases, which clearly shows an anti-correlation between power-law index and observed flux. The scientists added that the measured value of power-law index, when compared to other LMXBs with a neutron star, suggest the presence of such star in MAXI J1957+032 as in other faint systems of this type this value can be even as high as 3.0. Furthermore, the neutron star scenario is also supported by the observed thermal emission in the X-ray spectra of MAXI J1957+032. According to the paper, the obtained values of blackbody radius are very similar to that have been found in other systems proposed to contain neutron stars or in confirmed systems hosting such objects. All in all, the astronomers concluded that assuming the distance to MAXI J1957+032 to be around 13,000 light years, the results of the study suggests that the system indeed harbors a neutron star. However, they underlined that the currently available data does not allow them to conclusively state whether this system contains a neutron star or a black hole. More information: Aru Beri et al. Unveiling the nature of compact object in the LMXB MAXI J1957+032 using Swift-XRT. arXiv:1904.00914 [astro-ph.HE].